THE PETITE SUITE WASHROOM IS NEW!!! 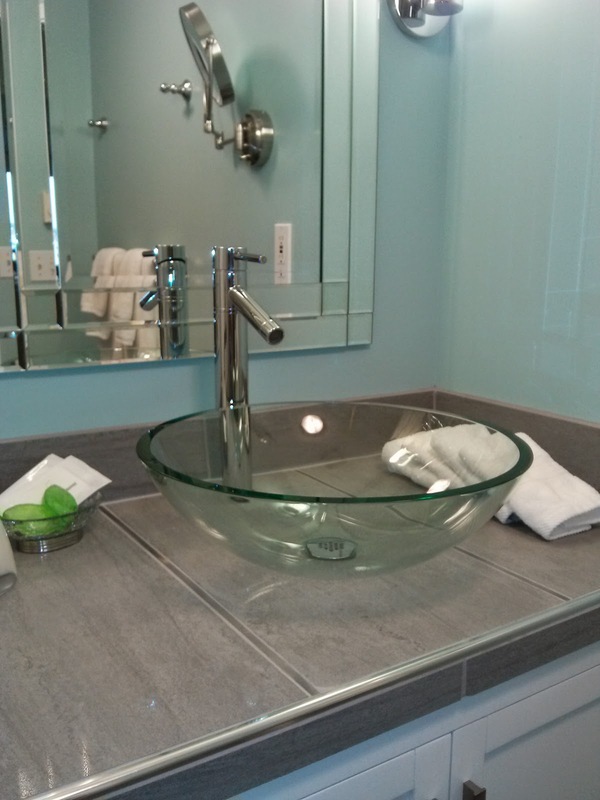 Our guests are enjoying the new vanity, glass sink, bright LED vanity lighting, 10x Magnifying mirror, newly tiled shower with pebble floor and custom shower niche, plus water efficient toilet with an excellent flush. 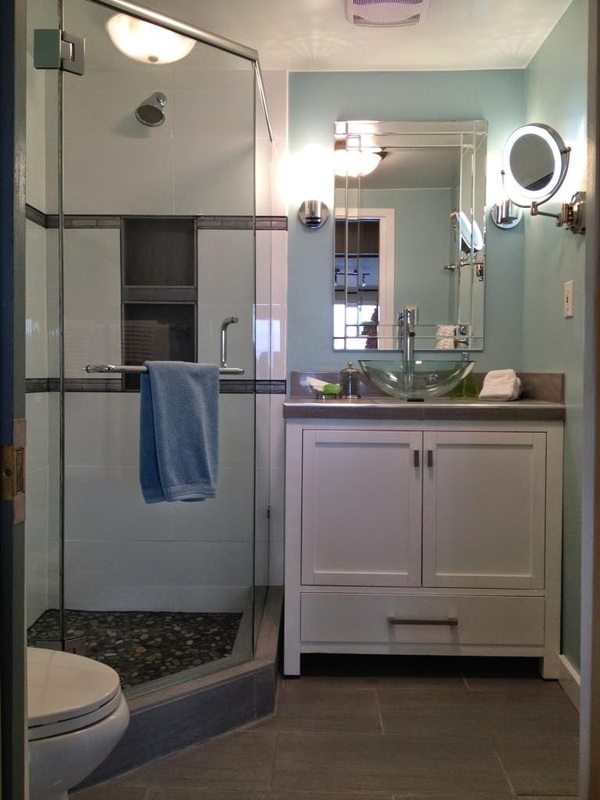 We love the new glass shower walls, blue wall color and floor tile. What do you think? "Rented the Petite Suite for a week at the end of May for just my husband and I. We were looking for a quiet cottage where we could hear the water and enjoy the beauty of Bowen Island and goodness did we get that! Such a lovely location (though could be difficult to get to if you aren't accustomed to rough roads). We spent our time dining on the deck, watching the rains come in, hiking and kayaking around the island, and enjoying the peacefulness that is Bowen Island.As a tall couple (husband is 6'5" and I'm 5'9") you sometimes fear hotels and rental homes for their low shower heads, short beds, low counter-tops. The biggest surprise of the Lazy Bowen cottage was that it was absolutely perfect for us taller folk. 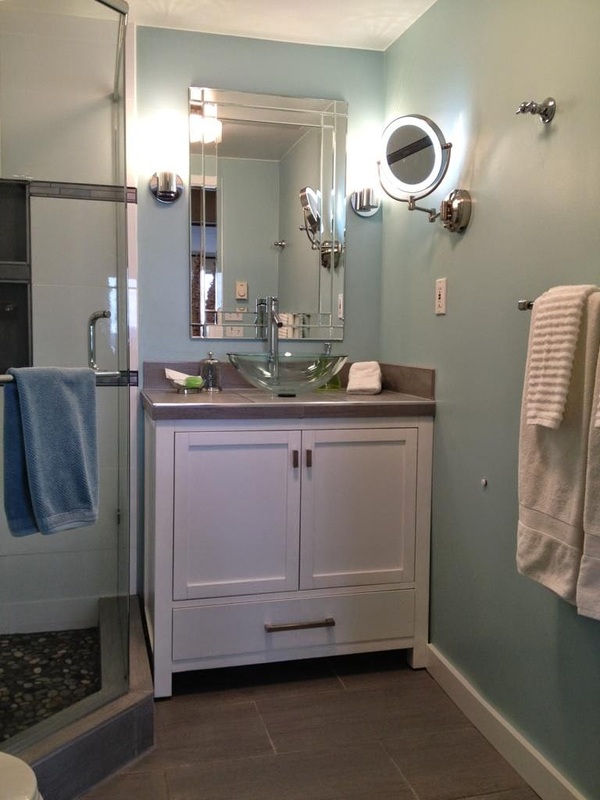 The newly renovated bathroom is perfect for us!" 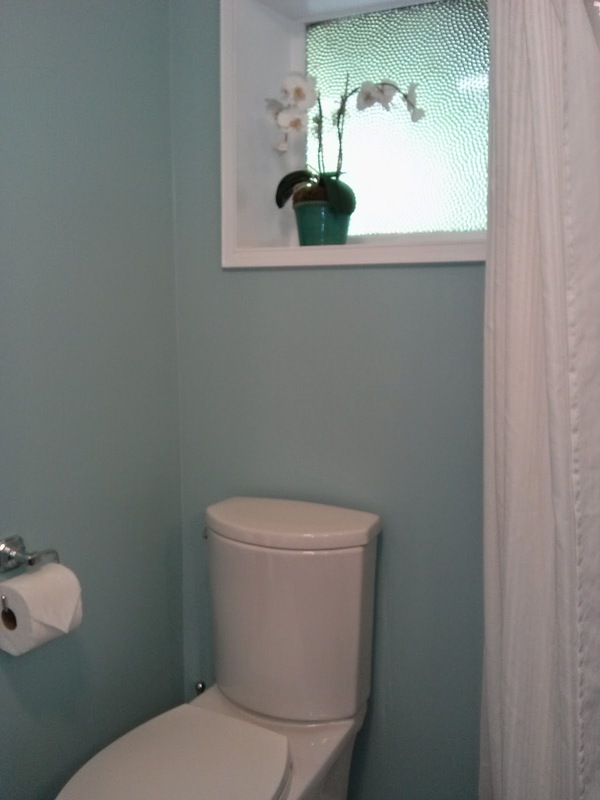 Scroll down to the next post to see the progression of this bathroom...............it is a far cry better today than in its original and then updated condition. We Highly Recommend Graham Ritchie and Matt Ritchie for your Renovations. This project could not have been completed in the 16 day time frame without the skill and focus of Graham Ritchie and his son Matt Ritchie. So much was accomplished in a short period time and ON TIME as well. 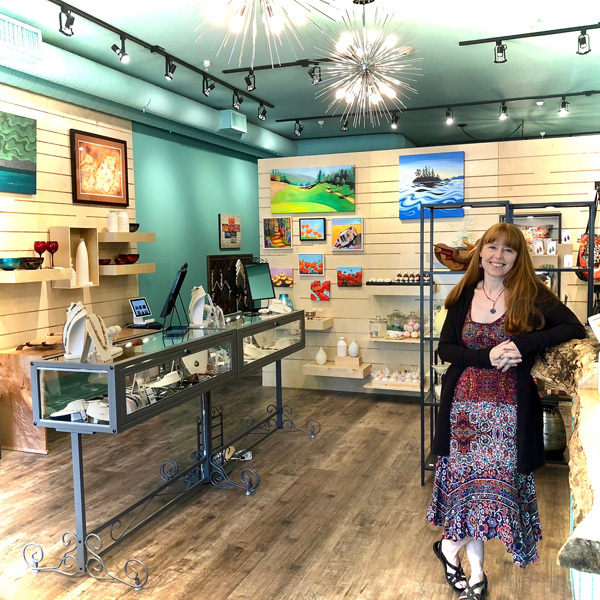 Matt specializes in painting and we know why.......he is the best on Bowen Island. A perfectionist!!! We highly recommend the Ritchies as they are dependable, reliable, skillful, knowledgeable, and they finish on time.